Fuel your muscles post-workout with Vega Sport® Protein Bar. Not your typical protein bar, you’ll enjoy the bold taste of chocolate-coated Crunchy Peanut Butter and Crispy Mint Chocolate flavors. Help support recovery with tart cherry powder. 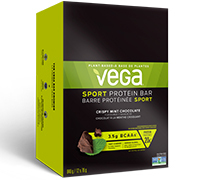 Enjoy Vega Sport® Protein Bar anytime, on-the-go.